I wanted to share my recent Shein haul with you guys!! I absolutely love their clothing for two reasons. One because they have the greatest styles and two because it is incredibly affordable. I loved all of these looks for different reasons. The blue/white 2 piece set was comfortable, cute, and showed a little skin. It was very stretchy which I liked as well. The white dress is so beautiful to wear for a special occasion or a night out. My favorite was the red dress. It was so cute and comfortable at the same time. This is a great look for anything! It’s the perfect length and can be paired with tights for a more conservative look with flats. Great looks! I really like the blue and white two-piece set and the red boots as well. I love those outfits! They are all so adorable! That outfit looks so good on you! 20% is a really great deal too. I must say, you look amazing in all of those outfits! I would love to have them all as well. So nice and very fashionable. That blouse and skirt is wow on you. You just look amazing. And the floral print dress is quite beautiful on you as well. You look awesome. Those are great looks and look great on you. Fall is my favorite, so any clothes for the fall season have my vote. Thank you! Fall is my favorite season as well. I love the clothing options! You are a babe! Omg I love the two piece look on you. Your figure is out of this world. Rock it girl! Lovely outfits they look so nice on you. I really like the black outfit love the design;. Thank you! I love that outfit also! 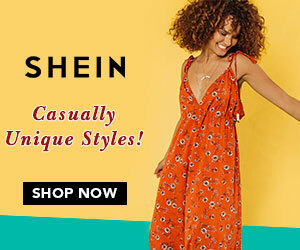 I love Shein, and that white dress with the red floral print is stunning. I love it. Yes! I love them, such cute clothes.